The hugely popular recipe book, with over 80 mouth-watering recipes! 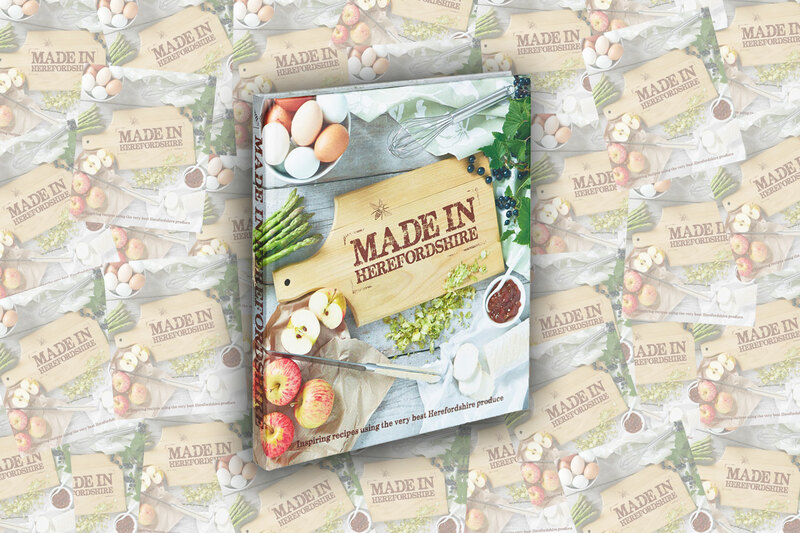 Made in Herefordshire is a wonderful 200 page hardback book containing a collection of inspiring recipes featuring the very best Herefordshire food, drink and epicureans. For lovers of great food and drink and supporters of local produce; locals, expats and visitors alike loved the Made in Herefordshire recipe book, which featured over 80 recipes from a wide array of companies from across this foodie county. From small village shops to national brands, they all have one thing in common, a passion for their heritage with roots deep within this rich and fertile county. 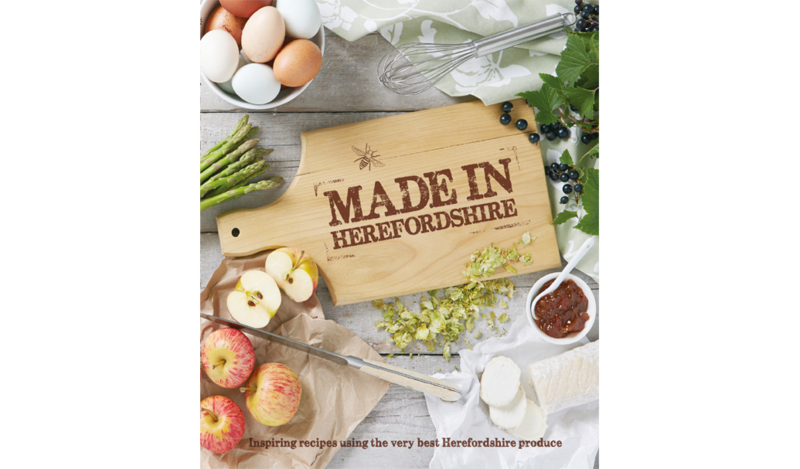 Made in Herefordshire is a beautiful book full of tasty recipes contributed by 80 gastronomic Herefordshire companies and individuals. Unusually, this book was the creation not of a food writer but of talented food photographers Rebecca and Simon Wild, who wanted to design an image-led cookbook that shared the best recipes that Herefordshire's producers, artisans and food lovers have to offer. They teamed up with local food and drink producer Jo Hilditch. County born and bred, Jo is always looking for ways to endorse Herefordshire nationally – this book was the perfect opportunity. The book took a year to research and compile. For the food-loving photographers it was a voyage of discovery and for Jo it was further affirmation that Herefordshire is a county overflowing with wonderful epicurean treasure. 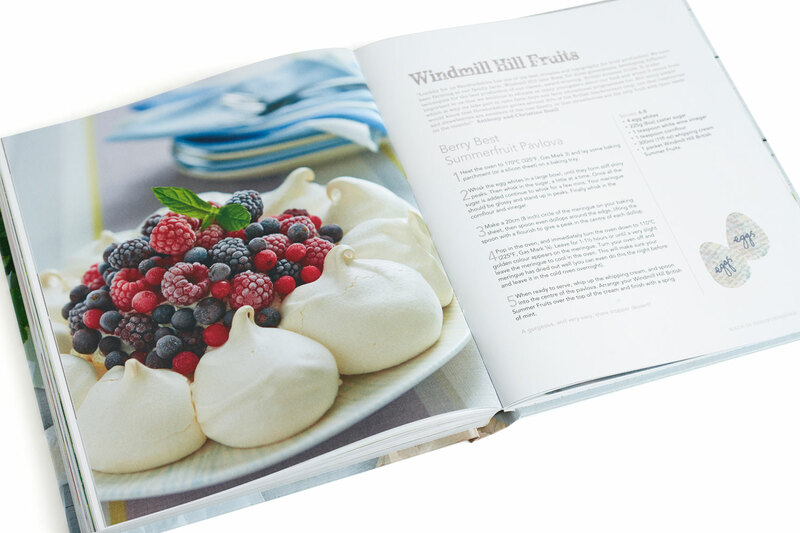 The idea came about as a lot of Rebecca and Simon's food clients were interested in creating their own recipe book, but the costs and logistics involved for one company to put a whole book into production just made the idea unfeasible. This project was born as a way to create a recipe book that could be as inclusive as possible to champion and showcase as many 'local' companies as possible. It was important to keep as many aspects of production within the county, including design, printing, publication as well as all contributors, so the project really was “Made in Herefordshire”. Herefordshire is one of the most rural counties in England and boasts a plethora of produce from asparagus to snails. However it is more readily known for it's steaks, ciders and more recently crisps (Tyrells) and vodka (Chase). The mouth watering recipes in the cookbook have a truly rural feel and include; Rabbit with Cider, Chocolate and Stout Cake and Pheasant and Prune Casserole, to name but a few. A true taste of Herefordshire fayre and a perfect coffee table read. The book was launched in November 2013 with much fanfare at the Flavours Food Festival in Hereford, and also had a Royal launch with the Duke of Gloucester at one of the contributors farms. Made in Herefordshire received much local and national press coverage and accolades including the Telegraph “Cookbook of the Week”. By June 2014 all 3000 copies had been sold. In November 2014, by popular demand, we produced a reprint of the book. It is now available to buy online again here! We absolutely loved working with the amazing epicurean businesses of Herefordshire to create our very special recipe book. Below is a list of all the wonderful companies that were featured in the recipes, and links to their websites if you would like to know more, buy their products or find a stockist. Quality beef and lamb reared on our farm in the beautiful Herefordshire countryside. Honey made by happy bees in Herefordshire. A vintage inspired company with a focus on the home and family. Luxury self catering accommodation in historic surroundings for reunions, relaxation and romance. Award winning alcoholic fruit mixers, made on our family farm. Busy gardens and café open daily, serving fresh produce and own grown wine. Historic Herefordshire venue for weddings and corporate events. Homemade food in stunning re-ordered church in Hereford city centre. Cargill's Hereford site produces chicken products for retail and food service markets. A unique privately owned boutique townhouse hotel with an award-winning two rosette restaurant. The only officially recognised 'natural mineral water' in Herefordshire. The only independent, family run single-estate distillery in the UK. Family run farm shop, passionate about farming and Herefordshire countryside. A large and exclusive house in Herefordshire, perfect for self catering luxury. Suppliers of local free-range eggs, fresh from the farm. Court Farm grow a huge range of fresh seasonal fruit and vegetables. 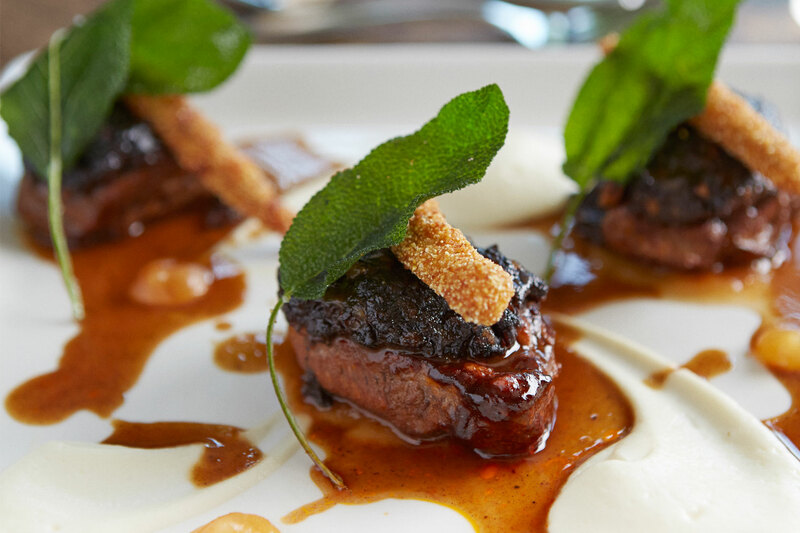 Delicious food and an inspiring atmosphere in a quality venue. Traditional village freehouse at the heart of Woolhope. A unique, idyllic hideaway for exclusive use & supper clubs. We produce white, sparkling and rose wines from crisp dry to rounded medium. Run by mother and son team from their vintage home in Kingsland. Supplier of goat's milk, goat's cheese and goat meat. Hand-tied, British grown flowers, scent with love. Traditional cider and perry from home-grown cider apples and pears. Free range, handmade Scotch eggs with personality, created with passion. Indulgent authentic recipes producing the finest range of additive free handmade breads and pastries. A network and directory of local food, bringing together producers, processors, pubs and restaurants,and consumers. Combining a diverse range of speciality and regional produce with the practical facets of a convenience store. Delicious food at our holiday home park bar and restaurant. Suppliers of quality chipping potatoes. Producing single variety apple juice. Top quality, award winning, luxury ice creams, sorbets and desserts. Warm, friendly service and top quality food sourced from local suppliers. Award winning family run microbrewery who use local hops for distinctive flavours. Locally sourced meat and high class deli. Visit our shop or buy online. 5 star country inn, stunning location, serving delicious local food. Convenient, tasty, nutritious meals made from fresh ingredients, sourced locally. Country dinner, bed and breakfast stuffed with total, local seasonal food! Fruit growers specialising in the production of sweet cherries. Herefordshire's best kept secret. Quietly converting people to our flavoursome beers. Contemporary village pub using local seasonal produce. Creating excellent drinks in our Herefordshire winery for the past 13 years. We specialise in the finest quality cheese, championing local artisan cheese makers. Delicious handmade chocolates with amazing flavours. Makers of artisan goat's cheese, soft cow's cheese, yoghurt and creme fraiche. The finest locally sourced meats from Herefordshire & Monmouthshire. Small artisan bakery specialising in handmade breads and patisserie. Real cider and perry in bottle and draught. Producer of award winning Herefordshire cider, perry and apple juice. Craft cider and perry makers. Importing enamel cookware from Hungary for outdoor kitchens and camp cooking. "A taste of Herefordshire". Locally grown and sourced fine foods. Juices and cordials made with lashings of fruit at our Herefordshire farm. Herefordshire's first and only authentic Indian cookery school. Pure Marches country-classic flavours in a Herefordshire style. Farm made ice creams and sorbet. Independently owned bar, restaurant and club. Bringing you everything fun, fresh & British. A gelato style ice cream made from sheep's milk. Stockists of dried herbs and spices from around the world. Michelin starred dining pub with accommodation. Chocolate bars, shards and other chocolate goodies. Freehouse, with restaurant and 3 ensuite B&B rooms. We make handcooked potato crisps from local Herefordshire potatoes. Herefordshire holiday accommodation at its best with slow food and slow gardening. Promoting and marketing our wonderful county nationally, regionally and locally. Producing mutton, hogget & lamb, eggs and apple produce. Producing refreshing cider and perry from delicious Herefordshire apples and pears since 1880. Quality, award winning, nutritious frozen fruit range that is 100% British. Regional brewery dedicated to brewing the best quality cask conditioned beer. A delicious healthy artisan cereal made of oats, seeds and nuts. Interesting and unusual traditional village shop & vintage tearoom. The perfect gift for any foodie! 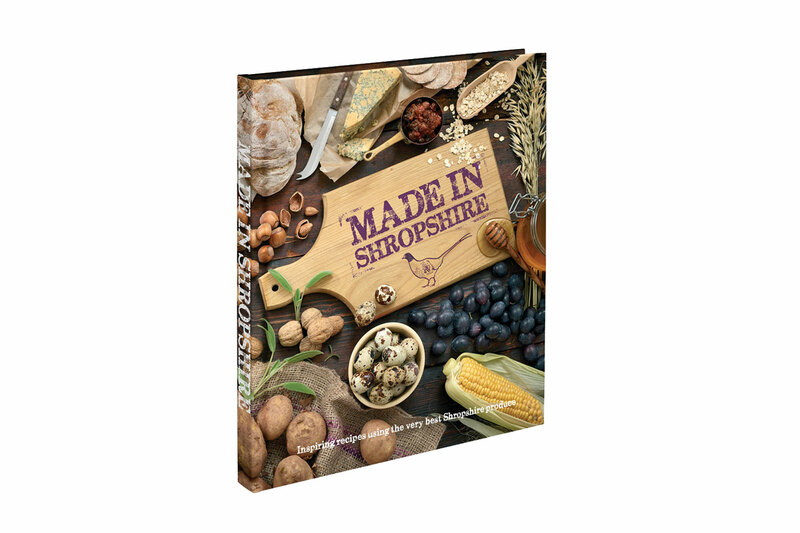 If you like Made in Shropshire, why not check out our other book, Made in Herefordshire. Click below to find out more!